The second in a groundbreaking paranormal mystery series, family PIs Grace and her skeptical granddaughter Cat are both blessed (or cursed) with the ability to slip into other people’s dreams (sometimes with control, sometimes not). This innate ability and its cultivation have lead Grace to solve many mysteries and while it led Cat to a killer, it also caused her to lose someone she loved. Deeply in mourning, Cat loathes her gift while Granny Grace continues to persist that dreamslipping, when controlled and embraced, is an extraordinary talent with the ability to unlock closed doors in the mind and seek justice for the injured. Cat remains unconvinced, but when Grace’s estranged brother, the critically esteemed artist Mick Travers, is accused of arson and murder, the dreamslipping family must team together under the same roof to discover the truth. Only, how can a family with the upsetting ability to drop into each other’s dreams function so closely, and what will Mick’s dreams actually reveal? Sure of her brother’s innocence, Grace is determined to unravel the dark recesses of the art world while Cat, meanwhile, wonders if her brooding uncle knows more than he claims. While the fire destroyed much of Mick’s work (and the life of his perhaps too attached assistant), his artistic value has now skyrocketed and when evidence of a girl becomes involved, Cat wonders if the dark sheep of the family has rightfully earned his name. In the first novel of the Dreamslippers Series, Cat in the Flock, a young, innocent, and overall jubilant Cat tries her hand at mystery and maybe even some of her Granny’s crazy Eastern fascinations. But when betrayal and death result in the solving of a crime, the bouncy Cat we knew is locked away in her own heart. Who can she trust and really, should she ever trust anyone with her propensity to inadvertently slip into the darkness of their dreams and expose them to the dangers of her PI life? The transformation is stunning and remains true to character, contrasting the light with the dark and allowing readers to mature with Cat. Unlike so many mystery books, the stakes are high for the characters themselves and while they remain dedicated, they are not unchanged by the sacrifices of such a life and of such a peculiar mental gift. Because of this, readers just fall into the pages and simply believe. When the dreamslippers all come together under the same roof, we feel the same compulsion of curiosity to look at Brunette’s elegantly crafted, surreal dreams and the same fear of seeing so closely into the souls of people we have come to know. The facts about them that scare themselves might scare us, might point the mirror back to introspection, and it is this very level of discomfort that makes the family dynamics so powerful here and the characters so distinct and simply visceral. The mystery interweaves with the character and family drama. I didn’t really think that anything could captivate me quite to the degree as Cat in the Flock did or Louise Penny’s Inspector Gamache novels. I certainly didn’t think that the mystery could be more complex and serpentine and while I like to put my own Sherlock skills to the test, this one left me guessing and often wrong. Splitting into three separate tendrils (possibly more, I was immersed in reading, not planning my review – sorry folks) the truth behind the arson and murder unveils other mysteries and mishaps of the past, multiple long held hatreds, and the competitive nature of the art world and these all seem like viable solutions at the time. But the story has more teeth to it than that and while we find many monsters wondering in the labyrinth of Mick Travers’ life, the ultimate evil isn’t unveiled until the end and believe me: it’s dark. Following the ending of Cat in the Flock, Burnette proves that she is not afraid to “go there” as it were – to the worst place possible for her characters. We cried with Cat as she held her dead boyfriend and the emotion was central to the character, but here we end up crying for the world and thinking about the very nature of evil and abuse. 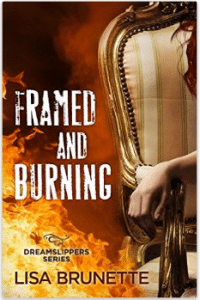 I can’t say more, because I don’t want to ruin it, but Framed and Burning isn’t afraid to play with you and then terrify you. It’s a mystery with teeth and wounds and loss. Unforgettable, charming in the creation of the characters and world, serpentine and dark, Framed and Burning is a mystery not to be missed. Now, I must wonder, what will Granny Grace and Cat be up to next? Frances has a Masters in Fiction Writing from Johns Hopkins and works as a technical writer during the day, where she attempts to make software exciting.